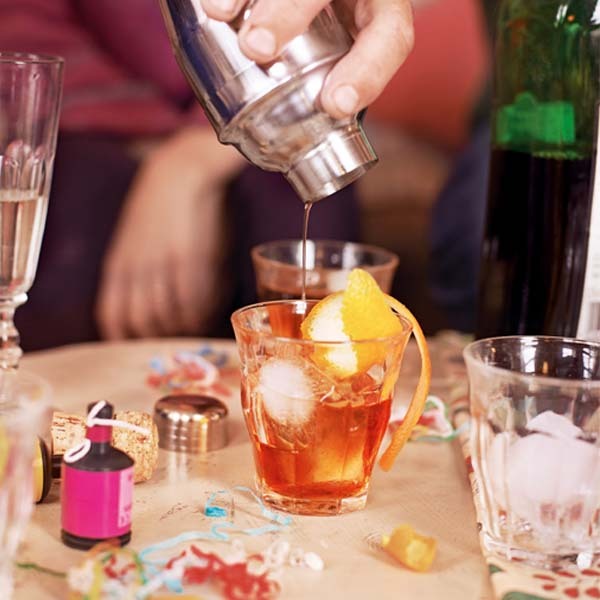 A variation on the hanky-panky that combines gin and sweet red vermouth with a splash of Fernet Branca bitters. This recipe uses a splash of Jägermeister too. A great festive cocktail. Pour all the alcohol into a tall jug and cover with a clean cloth. When your guests arrive, top up the jug with ice, stir gently for 30 seconds, then strain into 8 small glasses filled with fresh ice (you can use a cocktail shaker for this if you like). Twist a strip of orange peel over the top of each glass to release the citrus oil, then drop into the cocktails. Great for making ahead and serving to guests as they arrive.